Vaseline Petrolatum Jelly BUY Lubricating White Petrolatum Jelly, 00521234500. Vaseline Jelly Original is tested and clinically proven to help provide moisture and protection to dry or damaged skin. 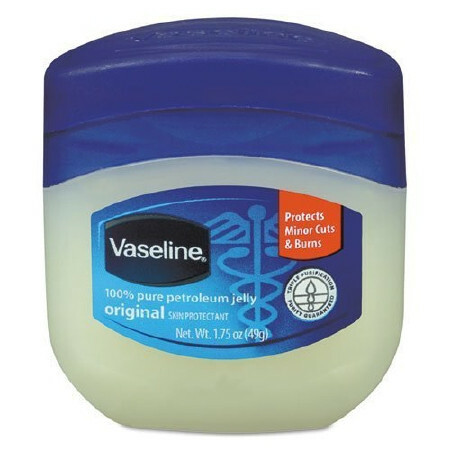 The unique formula of Vaseline Petroleum Jelly Original provides relief and protects minor cuts. It is made with a guaranteed triple-purified petroleum jelly and is highly recommended by dermatologist all over the world. When applied to the skin it can relieve dry, stressed, and sensitive skin. It can be easily spread against the skin and is ideal for problem areas, such as the feet, elbows, hands, and heels. It can be applied multiple times throughout the day. I like vaseline, because it works for people with very sensitive skin. Many products do not. Also, Vitality Medical has a pretty good price. I've been paying more at the pharmacy.